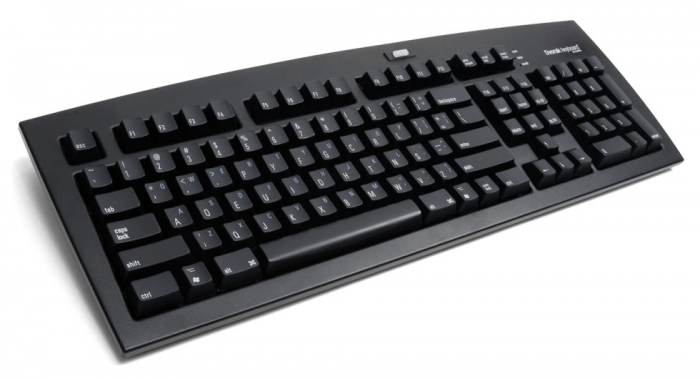 World speed record holder: The world record for fastest typing was set using a Dvorak keyboard. Barbara Blackburn of Salem, Oregon, achieved cruising speeds of 150 to 170 words per minute, and peak speeds of 212 wpm — that's an incredible 17+ key presses per second! Other famous users include Apple co-founder Steve Wozniak and BitTorrent inventor Bram Cohen. Less work = less hurt: Since your fingers work less on Dvorak, you're much less likely to develop repetitive strain injuries from typing. RSI sufferers that switch to Dvorak commonly report their pain disappearing after a few months of use. 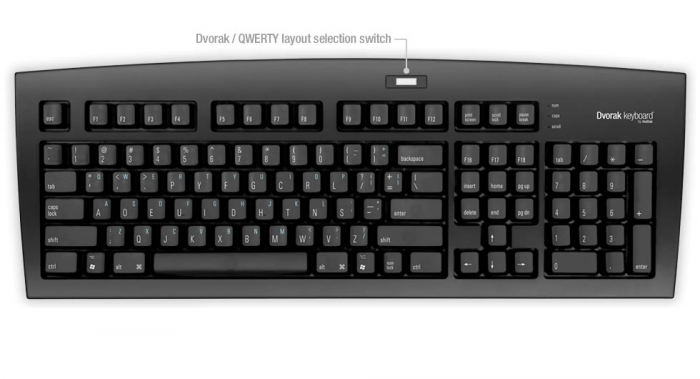 Hardwired Dvorak layout: The Matias Dvorak Keyboard gives you the Dvorak layout, hardwired right into the keyboard. This approach has advantages that software-based solutions can’t offer. Software Dvorak layouts may not take effect until after you log in, so if you need to type a password, you’re stuck typing it in QWERTY. With the Matias Dvorak Keyboard, you’ll never have this problem. Switchable to QWERTY on the fly: A layout selection key lets you instantly & easily switch the layout to standard QWERTY and back, for those times when non-Dvorak typists want to use the computer. 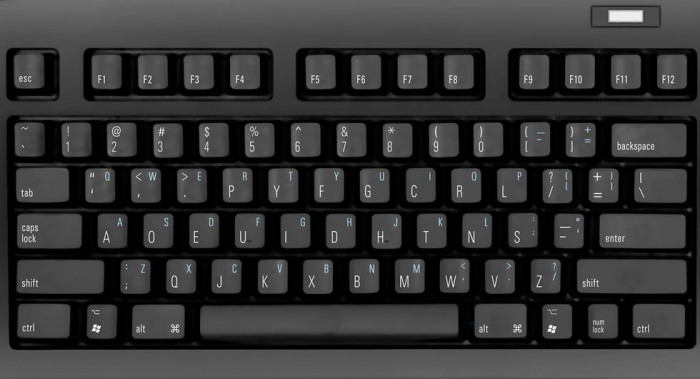 The keyboard is labelled with both Dvorak and QWERTY key legends, so you can easily see which key is which. Great for beginners — and the undecided: If you're thinking about learning Dvorak, getting a Matias Dvorak Keyboard is a great way to start. You have the Dvorak layout printed right on the keys, for easy reference while you're learning. Plus, with the press of a button, you can switch back to QWERTY, if you decide that Dvorak's not for you. Comfortable tactile feel: High-quality dome switches give the keyboard a responsive, tactile feel, with enough resistance to hold the weight of your hands. This reduces long term fatigue and makes it a lot more comfortable to use. 2-port USB hub: A built-in USB hub lets you connect your mouse or trackball directly to the keyboard, keeping your desk neat and tidy. Almost banned from competition: Shortly after the Dvorak layout was introduced, its users began winning typing competitions. For almost a decade, they swept the field. Contest officials tried to have them banned for “unfair competition.” One year, their machines were sabotaged, leading Dvorak to hire security guards prior to competitions. In 1982, the Dvorak layout was finally designated as an alternative standard by the American National Standards Institute (ANSI). Compatible: Windows 7, Vista, XP, 2000, Linux, and Mac OS X or Mac OS 9.